Choose from our wide selection of dice including store dice, jumbo dice, cancelled casino dice, and dice with imprinted multi-color spots. These dice are available in sizes ranging from 5/8" to 3-3/4"
Our Jumbo Dice come in four sizes: 1", 1-1/4", 1-1/2", and 2". (The white, regular-size die on the right side of the photo shows scale). You can choose from transparent red, transparent green, and opaque white for these large dice. These big dice are available by the pair. These Multi-Color Dice feature an overall white color and imprinted red, blue, and black spots. Multi-Color dice are available by the pair in 3/4" and 5/8" sizes. These 1" and 2" oversized dice feature unique, slightly marbleized colorations. 1" Lemon Color Tropical Dice are available, as well as 2" Tropical Colored Dice in these colors: Lime, Pink Lemonade, Lemon, Ice Blue, and Watermelon. Store Dice are available by the pair in 3/4" (19mm) and 5/8" (16mm) sizes. 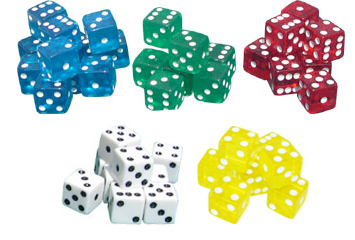 A range of Dice colors are available, including black, blue, green, orange, pink, purple, red, white, and yellow. We offer both Opaque Dice and Transparent Dice. SALE: Save 35% to 38%! These Novelty Dice are made of lacquered, maple colored wood. The Dice measure 1" each and are available by the pair. This stylish Poker Dice Set features five high gloss metal dice in a handsome aluminum carrying case. The side of the case showcases the Caesar's Palace logo. A sturdy steel top-clasp keeps the Dice Set closed during storage / transportation. Feel free to browse our selection of Dice Cups, Dice Cages, and Dice Game Sets. Or, contact us at 1-800-233-0828 for a FREE gaming catalog.